All 9 stones of the basic chakra kit; Black Tourmaline, Carnelian, Yellow Aventurine, Rose Quartz, Blue Chalcedony, Blue Tigers Eye, Amethyst, Green Fluorite and Blue Kyanite with an ethically mined Lithium Quartz. 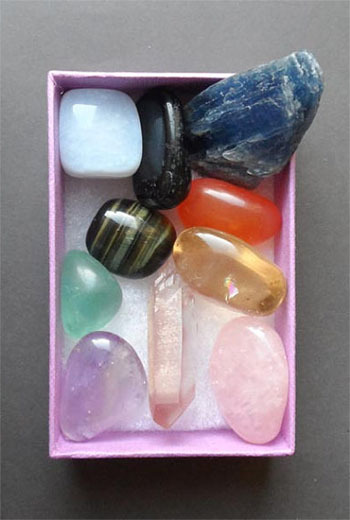 Of the numerous stones used for crystal healing, many of the most effective and popular contain lithium, a light alkali metal. The most powerful lithium crystals available are lithium in quartz, as the quartz further amplifies its unique healing properties. Many consider lithium quartz the most powerful balancing, anti-depressant and mood stabilizing stone available.